With three days in Frankfurt, you’ll have plenty of time to tour the city’s historic monuments and museums, and to explore farther afield. To maximize your time, look for tours that combine multiple attractions in one day or take advantage of money-saving deals and sightseeing passes. Here are some ideas. Joining a guided sightseeing tour or hop-on hop-off bus tour is a great way to get your bearings and make sure you don’t miss anything. Listen to the onboard commentary as you drive through Frankfurt’s Financial District, past historic sites like the Frankfurt Stock Exchange building and the Eschenheimer Tower, and towering skyscrapers like the Main Tower. Jump out to explore the Altstadt (Old Town) on foot, starting at the main square, the Römerberg. After admiring landmarks like the Rathaus (Town Hall), St. Nicholas Church, and St. Bartholomew's Cathedral, stroll along the Zeil, Frankfurt’s main shopping boulevard, and browse the stalls at the Kleinmarkthalle, Frankfurt’s daily food market. Continue sightseeing into the evening with a scenic cruise along the Main River and enjoy dinner onboard as you admire the illuminated skyline from the water. The UNESCO-listed Rhine Valley is the most scenic stretch of the Rhine River, flowing between Mainz and Koblenz. Set sail aboard a traditional steamer and cruise past the vineyards, medieval towns and mountaintop castles of the Rhine. Stop along the way to visit historic Rudesheim and the landmark Loreley Rock, enjoy wine tasting at a family-run winery, or savor lunch with a view at a riverfront restaurant. You can choose to explore this region on a full-day cruise from Frankfurt or opt for a Rhine River cruise pass and take in the sights at your own pace. Alternatively, combine an afternoon cruise along the Rhine with a morning visit to Heidelberg, where highlights include the hilltop Heidelberg Castle and the picturesque Old Town. Frankfurter’s Museumsufer, or Museum Embankment, stretches along the south bank of the Main River and is home to 13 museums. Spend the morning admiring the artworks at the Städel Museum, visit the German Museum of Architecture or the German Film Museum, or browse the exhibitions at the Museum of World Cultures. In the afternoon, enjoy a change of pace and take a walk around the Palmengarten, one of the largest botanical gardens in Germany. Alternatively, pay a visit to Frankfurt Zoo, where the 4,500 animal residents include tigers, giraffes, gibbons, and rhinos. On your final evening, head into the atmospheric Sachsenhausen district, where the cobbled lanes are filled with restaurants, bars, and jazz clubs. Perhaps enjoy a dinner of traditional Frankfurt cuisine, sample the city’s famous apfelwein (apple wine) at one of the historic wine taverns, then go bar-hopping along Dreieichstrasse and Bruckenstrasse. Visit two of Germany’s most popular attractions in one day with this Frankfurt Super Saver tour. See majestic Neuschwanstein Castle, one of three palaces built by King Ludwig II of Bavaria and the inspiration for the Disney movie Sleeping Beauty. Then explore the Jewel of the Middle Ages, the picturesque town of Rothenburg ob der Tauber, perhaps the most well-preserved medieval old town in all of Germany. Combine two best-selling tours at one discounted price. Round-trip transportation from Frankfurt and Neuschwanstein Castle admission fees included. See the best of Frankfurt by land and water on this combo city tour and steamboat cruise on the historic Rhine River! 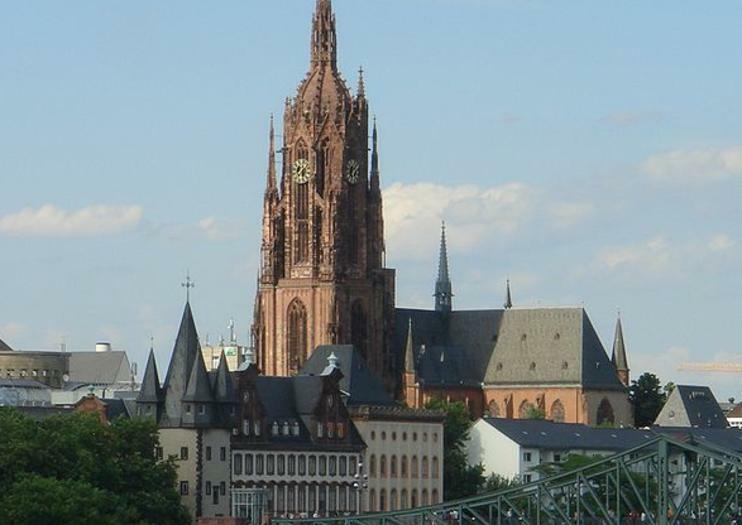 Enjoy a guided morning coach trip through the Frankfurt City, where you’ll see landmarks like St Paul's Church, Frankfurt Cathedral, Goethe House and Hauptwache Plaza, and on to the UNESCO-listed Rhine Valley for breathtaking natural vistas. You’ll break for lunch before your afternoon sightseeing cruise, and conclude your day with a fun wine-tasting session. Spend an unforgettable day touring some of Southern Germany’s most lovely destinations! Depart Frankfurt on a scenic journey to riverside Heidelberg, where you'll marvel at stunning city sites from medieval Old Town to bustling Heidelberg University. Soak up the many sites and flavors of Germany as you visit castle ruins, see lovely villages and vineyards, cruise along the UNESCO-listed Rhine River, and indulge in a delectable dinner and wine-tasting session. Revel in the beauty and history of one of Europe's great waterways with this hop-on/hop-off cruise pass on the romantic Rhine River. Admire passing scenery like legendary Loreley Rock and imposing castles while sipping a coffee or beer on deck, and customize your itinerary with 19 different stops at tiny medieval towns and bigger cities along the way. The pass is valid all day on the UNESCO-listed Middle Rhine from Cologne to Linz and Koblenz to Mainz. Admire Frankfurt from the water on a 100-minute sightseeing cruise along the Main River. Starting from Eiserner Streg(Mainkai) in central Frankfurt, enjoy views of the city skyline as you hear audio commentary about the city's highlights. Sights you’ll pass include Staedel Museum, St. Paul’s Church, Romer, The Three Kings Church, and Portikus. This 2-day Frankfurt Card Group Ticket is a great way to save money and make the most of your time in Frankfurt. Instead of spending time in lines booking individual tickets, up to five people can travel on this card. You’ll have the freedom to customize your trip, and plan an itinerary that works for you. This ticket will give you unlimited travel, and up to 50% discounts on attractions, such as museums, and Rebstockbad waterpark. Visit the beautiful city of Cologne on this guided, full-day sightseeing tour from Frankfurt. Enjoy a scenic drive north to Cologne, then hop on a double-decker bus to see many of this 2,000-year-old city’s top attractions. Pass by the Romanesque Catholic Great St. Martin Church, bustling Roncalliplatz, the historic Alter Markt square, Cologne City Hall and much more. Then visit the Cologne Cathedral, Germany’s most-visited site, for an independent tour. On the return trip to Frankfurt, discover the medieval old town of Limburg. Frankfurt is home to a great number of landmarks and attractions, but getting around the city on foot takes time and effort. With this 24-hour hop-on hop-off bus tour ticket, spin through the city in comfort and enjoy fine views along the banks of the Main River. Hit sites of interest including the Hauptwache and the Senckenberg Museum with ease, and enjoy the freedom to explore Frankfurt at your own pace. Discover top landmarks and famous sites in one of Germany’s most vibrant cities on this private 2.5-hour Frankfurt city highlights tour. Travel by air-conditioned vehicle and discover city attractions such as the medieval Römer, St Paul’s Church and Frankfurt Cathedral. Head into Old Sachsenhausen with your private guide, where locals enjoy coffee in buzzing cafes. Cross the Main River toward the Old Opera House and Hauptwache. Learn of 18th-century poet Johann Wolfgang von Goethe at Goethe House and admire soaring skyscrapers at the Frankfurt Stock Exchange. Learn how a sleepy medieval trade center became a cutting-edge financial capital on this in-depth walking tour of Frankfurt. Highlights include half-timbered houses and a 13th-century church, the birthplace of the writer Johann Wolfgang von Goethe, and the spot where German kings and emperors were once coronated. Tours depart every hour, so you’ll be sure to find a time to fit your schedule.